First there is the obvious filtering effect of passing the water through extremely fine sand. This results in a mechanical exclusion of particles larger than the grain size of the sand. This can result in a very effective clarifying of the water. It also increases the residence time of the water in the filter as it passes very slowly through the layers of sand. 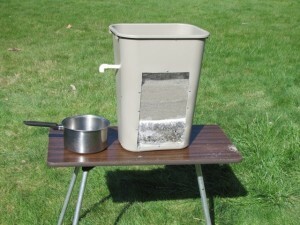 Some filters can include charcoal or other absorbent materials to remove some chemicals and odors from the water. The sand filters we construct also contain a disinfectant layer of finely ground metallic material which functions as an additional biocide layer to kill bacteria and other organisms. Finally, with use, an active biological layer forms on the surface of the filter. These live organisms feed on and destroy pathogenic bacteria and parasites. In German this layer is called the “schmutzdecke”and is an important part of the purification process. With maintenance these sand filters can last for a number of years.